Meet Blyth of Super Voices! You are here: Home / The Spin / Meet Blyth of Super Voices! Blyth Grimmett used to live up north, where he worked at various jobs in the small mining town of Cassiar. 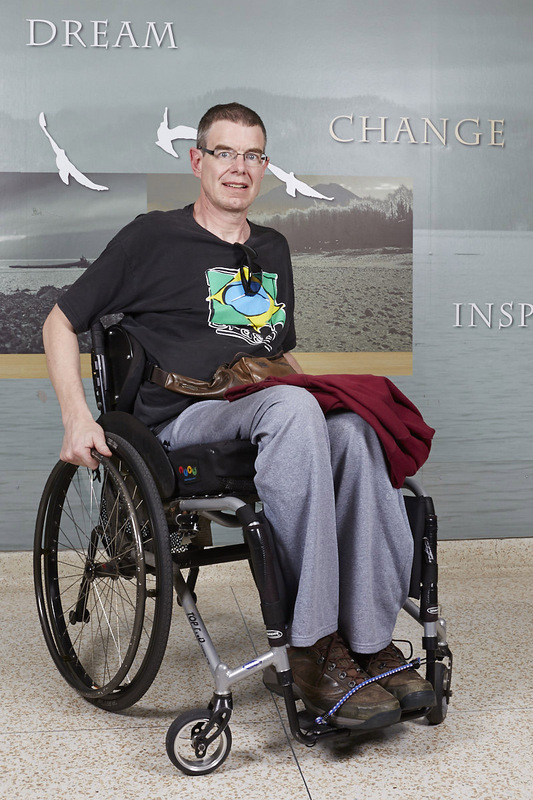 Blyth now uses a wheelchair after a spinal cord injury. Blyth is a storyteller who loves the challenge of creating his stories for performance. Super Voices will be the third Realwheels community project in which Blyth has participated. Here is a link to an audio clip from our conversation. Liesl: How long have you been with Realwheels? Blyth: This will be my third time. The first two times were with James Sanders and this time it is with Jeffrey. Liesl: What is the difference between the two directors? Blyth: They are very similar. Jeffrey has a good eye for reading people and helping them improve how they project themselves. Jeffrey is teaching us breathing and how to stay focused on our performance. James has has a lot of charisma and is good at psyching up the group. Both are very talented. Liesl: What is your performance? Blyth: My super power is surviving manic depression. I connect with it on a spiritual level, and then talk about my skills and interests and attitudes. Then, I speak about the importance of wheeling on a daily basis, and weightlifting. Liesl: Is there an element that brings the group performance together? Blyth: There is a sequence of moves that is coordinated. It’s a more theatrical performance. Last year, there was a more musical element tying it together, between each speech. Liesl: Are you excited about performing? Blyth: (As smile bursts out) I’m looking forward to trying to give it a shot! Liesl: Do you get nervous? Blyth: Aaaah, yes. I am working on it… taking the challenge, to have it come off in a successful way. I’ve been involved in karaoke for a long time. I used to run the program [at GF Strong]. “I Will Survive” is a song that got me out of my depression. Getting into that song turns me around and always makes me feel better. Liesl: How did you find out about Realwheels? Blyth: The karaoke lady, she’s the Rec Coordinator. She made me aware of it. Liesl: Were you nervous that first time? Blyth: I was feeling pretty good. My mood was pretty positive. Now I am a little depressed. But it’s not as bad as it used to be. It’s not as severe as it was in the past. I had a fall in 2002 that changed my brain chemistry and lessened my manic depression. My mood swings aren’t as bad and I can get out of them easier. Liesl: Do you go to the theatre or concerts? Blyth: I went to [Realwheels’ production of] Re-calculating. I wanted to see Dave Symington and he was good. He pulled that off very well. Liesl: What keeps you coming back? Blyth: The challenge to be in a group, to focus on interacting in the group’s activity, and trying to work on a speech so that I can memorize it and say it to the public, I guess. Liesl: What have you learned about storytelling? Blyth: Breathing and pausing. Including the audience. Liesl: Is there something that stands out about Realwheels for you? Blyth: There are a lot of people that are positive-minded and they really try their best to encourage us. That’s always there. If we ask a question, there’s always ample response from the leaders. [David] Roche gives his feedback and Jennifer [Fader] gives her feedback, and it all comes together as some good advice. 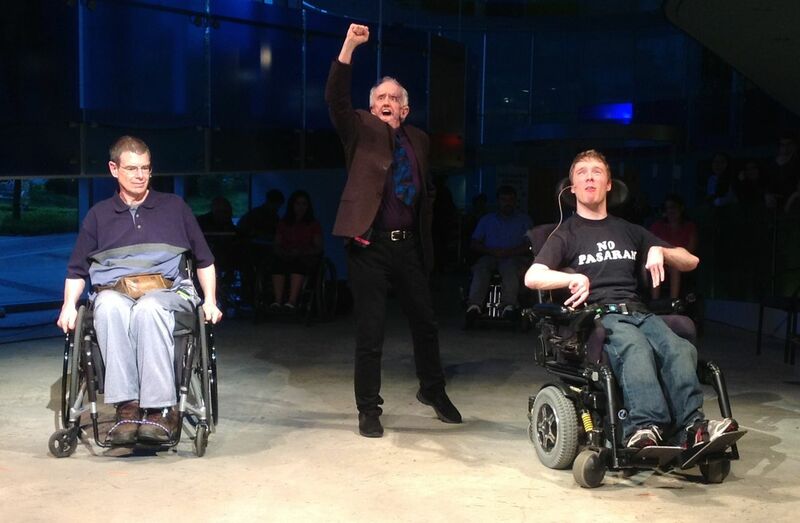 Liesl: Do you see your experience, as a person with disability, reflected in the cultural life of our city? Blyth: Well, I’m always on my own, independent, so wherever I go I am wheeling on my own. That’s motivating for people who aren’t in a chair and they see me getting around, so they are inspired to be more active in their own way. Liesl: What would you say to others who might be interested in participating in Realwheels? Blyth: I would say it’s a good experience and I find it worthwhile and I would recommend it to anybody who is interested. Liesl: So, your bio says that you worked in a small mining town? Blyth: From 1984 to 1992, I worked doing odd jobs, painting houses, landscaped and shovelled snow. They got twenty feet of snow a year in Cassiar! I would shovel the roofs when they got three or four feet deep. I worked in recreation and at the general store as a clerk. I sharpened skates and ran the Zamboni. I like small town life. Liesl: What’s your happy place? Blyth: I go to a coffee shop and enjoy a hot coffee. Sometimes I have someone to have it with. Liesl: Thank you so much. Have fun! Interview by award-winning director, dramaturg, and playwright, Liesl Lafferty. Nice to se your picture and hear your voice again after 31 years . Time flies. Back then we were strong and had some exhausting badminton matches. I will never forget our final match, where you won by throwing you, so you just reached the badminton ball just before it touched the floor, and you won by only one point. When I visited Vancouver in 1987, you especially Blyth and your family wellcome me with love and warmth .I will never forget it, thank you ! Hope you will receive this message and hope to hear from you.